Roberto (second from left) helped assemble a team of 11 artisans, many of whom are from one family to form Quavaro Artisans in Leaon, Guanajuato, Mexico. Cesar is at the center. You can see the thought that goes into everything at Quavaro leather goods. The plan of the store’s open, sunny interior; the clean lines of the leather goods lining the walls; and the logo, simultaneously reminiscent of artisan stitching and the Art-Deco period of aviation that inspires the designs. Cesar and Pial Vega took the money they had saved to buy a home on the Hill, and instead opened a business here –and a factory of their own in Mexico. The couple still hope to buy a house here, but first they want to build their business. And they say the Hill is the perfect place to do it. 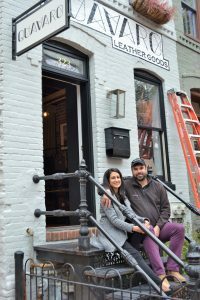 “The neighborhood really captures the historical imagination, adding to our story and our brand,” said Cesar. Owners Pial and Cesar Vega pose on the steps of Quavaro leather goods (323 Seventh St. SE), the shop they opened in November, 2017. Earlier this year the two opened their own factory in Mexico. Married five years ago, Pial and Cesar took a break from careers in international development and data analysis to travel the world, visiting more than fifty countries. 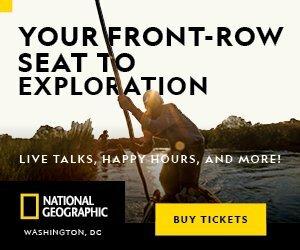 When they returned to the District, they wanted to do something that would combine their love of travel with a desire to do something positive in the world. “After all that travel, we realized how important the right bag could be,” said Pial. They decided to design and manufacture ethically-made leather goods, marrying design and ethos but not dropping affordability. 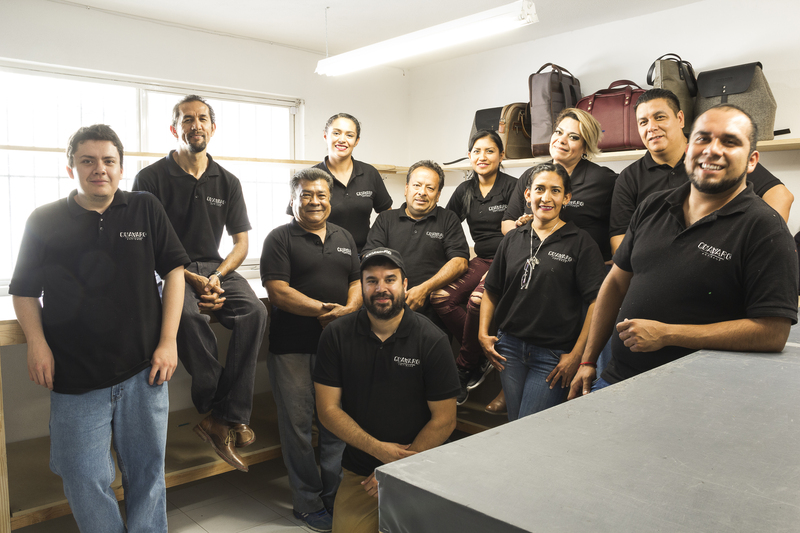 In order to design the bags they envisioned, Pial and Cesar started their own factory in Leon, Mexico. Quavaro Artisans offers its 11 employees an eight-and-a-half-hour day and benefits from day one. All materials used in the bags are bought directly from the suppliers, and Cesar has met all of them. Pial said starting the factory was nerve-wracking, but it allows them total control over the process. “It makes a huge difference in the quality of our bags. We want to produce bags that will last a lifetime,” said Pial. Pial and Cesar design every item, based on their experience traveling and drawing inspiration from 1930s and 1940s aviation, an era adored in childhood by Cesar and his father. You can see the inspiration of the golden age of aviation in the Albatross, weekend luggage based on an aviation helmet bag. With a water-proof interior and three interior pockets, the Albatross is available in full leather, but also in a vintage-inspired green felt canvas that really carries the vibe of the period. Nathalie Childress, a program coordinator in higher education, is a satisfied recent customer. Childress bought her go-to bag, a red leather backpack called the ‘Piper,’ at Quavaro in the spring. “I loved that Pial could tell me the provenance of every component of the bag,” Childress said. Visit Quavaro (323 Seventh St. SE) 11 a.m. to 7 p.m. Wednesday to Friday and 10:30 a.m. to 5:30 p.m. Saturday and Sunday. Now until Christmas, Quavaro will be open 11 a.m. to 7 p.m. Mondays and Tuesdays. Go online atwww.quavaro.com or call the shop: 202-507-1650. Owner Meka Mathis poses behind the reception desk at Skin Beauty Bar (749 Eighth St. SE) keeps the spa offerings fresh. When traveling, she visits a spa in every city, just to check out what they’re doing. Skin Beauty Bar is pristine. The whole spa feels like it is fresh out-of-the-box and staged for its grand opening. Although the spa looks brand new, it has been located upstairs at 749 Eighth St. SE (right next to District Doughnut) since 2014, when it moved down Barrack’s Row from its original location on the 400 block. 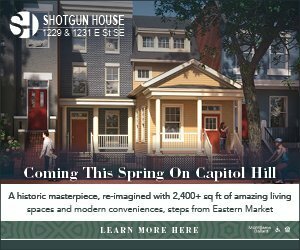 Born and raised in DC, owner and lead aesthetician Meka Mathis graduated from New York City’s Parson’s School of Design. Graduating in 1998, she returned to the District a few years later to open Skin. With more than 20 years’ experience as an aesthetician, Mathis has brought together a five-member team of professionals to offer nationally-recognized spa services, including herself and another aesthetician, an eyelash specialist, a nail artist and a massage therapist. 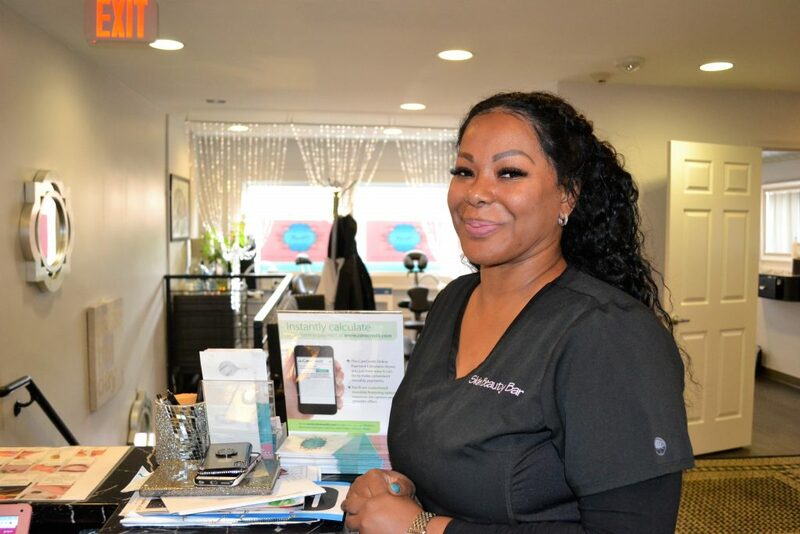 Together with Rochelle Skin’s other aesthetician, Mathis offers services including facials but also ear candling, teeth whitening and microblading, a form of tattoo artistry mimicking natural hair in the brows. Skin also offers head-to-toe waxing and a service called a ‘vajazzle,’ which involves the bikini line and crystals or glitter. “Believe it or not, our biggest category is the Brazilian wax,” she said, coming in just before facials and followed by eyelash and eyebrow tinting, which she said is trending. In 2011, Skin Beauty Bar’s air-brush tanning services were selected as the best Airbrush Tan in Washington DC by InStyle Magazine. Customers choose a shade and enter a small tent to be treated. The mist takes seven minutes to dry, leaving the body flecked with gold specks for the return home. After seven hours, a shower reveals the skin’s new glow. The holidays are a great season to visit the spa, both to relax from related stressors and to maximize beauty potential before the whirlwind tour of parties, dinners and family gatherings. Relaxation is a gift to the self at this time of year. Seated massage is available in five- to ten-minute blocks, and Mathis just added a brand-new massage room to the facilities. Massage therapist Ray Tarber offers deep tissue as well as Swedish, hot stone and Reiki massage, and can also do isolated stretching and cupping. The shop can accommodate parties for up to 40 clients, and offers packages tailored to brides and vacations. New clients who mention seeing Skin Beauty Bar in the Hill Rag get 20% off services. Skin Beauty Bar (Second Floor 749 Eighth St. SE) is open Wednesdays and Thursdays 12 p.m. to 8 p.m., Fridays and Saturdays 10 a.m. to 4 p.m., and Sundays 12 p.m. to 5 p.m. Call Mathis at 202-543-6993, or book online through the website.